Kae Horii (Erika Sawajiri) moves into her new flat in an undisclosed area of Kyoto. While unpacking her belongings, she discovers a hidden compartment behind a inconspicuous mirror. In that compartment, Kae finds a notebook, that turns out to be a diary belonging to the previous tenant. Later that evening Kae starts to read the diary. The writer of the diary is Ibuki Mano (Yuko Takeuchi), a young lady about to embark on her first year as an elementary school teacher. Ibuki is also in love with a man named Takashi, who may or may not hold similar feelings for Ibuki. The diary immediately resonates with Kae, as she plans to become an elementary school teacher herself. Ibuki’s experiences also works as an inspirational instructional guide for Kae’s own personal life. Kae is also in love with an aloof illustrator/artist (Yusuke Iseya), who may or may not hold similar feelings for Kae. 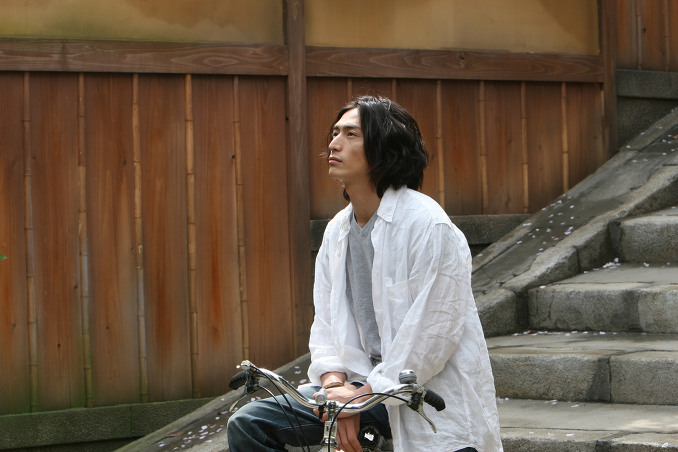 Based on novel "Closed Note" by Shusuke Shizukui (first published January, 2006 by Kadokawa Shoten). Ize Feb 14 2012 11:28 am I love this movie. He is perfect, the story is perfect, the place is perfect, I watch it every day and recommend it to everyone! Lyn May 04 2011 4:25 pm My comment would be the opposition of the above comment. I would like to say that whether the movie is good or not is dependent on the taste of viewer. I have just finished watching Closed note. I would like to say that I really love this movie. The movie is really realistic and beautiful for me. The scenery, the music and other effects blended really well, and make the movie dazzling and peaceful. The ending actually is good, though quite sad. I like the way Kae-chan behaved. She liked Takahashi-san but not desperately like in other typical drama. I like the ways all the main characters think about love and life. There are some details which seem to be not necessary; however, I still think that the seem-to-be unnecessary details have made the movie more realistic. The storyline of this movie is simple, but I enjoy watching it more than some other blockbusters. Sorry to say that. Just my opinions. If you love a fast movie with impressive scenes , you shouldn't watch this. But if you love watching a dazzling, peaceful yet meaningful movie, I think whis movie can suit your preference somehow. Btw,I really like the place in the movie. I wish to know which city the movie take place :) so i can visit that place. Ki Feb 11 2009 5:19 am Problems with “Closed Note” are found in many areas. Take your pick between a storyline that’s all too familiar, an impressive list of actors who never mesh into their roles, and (probably the biggest fault of the movie) the just too damn slow pacing of the movie. The pacing was so slow that it caused this viewer to drift off into lalaland on two separate occasions. I believe Isao Yukisada’s intentions were to create a world similar to a living, breathing “I Love You” card, but the end result was more of an unbelievably sweet world where characters were incapable of jaywalking or cutting a fart (sorry had to say it). The slowness is most pronounced in the first half, while the second half picked up steam marginally. The choice of actors initially appeared as a strong point for the movie, but after watching “Closed Note” I can confidently say that pool of talent was completely wasted. Whether it was Hiromi Nagasaku relegated to smiling throughout her screentime or Yusuke Iseya cast as a shy artist (didn’t believe it for one minute) or the lack of chemistry between all the main characters, the word “underwhelming” would have been the perfect tagline for “Closed Note.” There’s also poor choices in the editing realm, with sub-plots (girlfriend goes to London, boyfriend loves Sawajiri) that exists for no real good reasons and is forgotten by the second half of the film. About the only positive thing that can be said about “Closed Note” is that film isn’t terrible in any particular area. But with it’s mediocre storyline, underwhelming performances, odd editing choices, and pacing that is slow as molasses, well you got a movie that works remarkably well when you need take a nap. And that’s about it.